The board of directors of the Cornell Star and Crescent Foundation is pleased to announce that Peter P. Brown '82 submitted the winning entry in the recent competition for a logo for the new foundation. "The new logo is vibrant, exciting, and forward looking, qualities that parallel the aims of the new foundation," announced George Doerre '04, the foundation's board president. After graduating from Cornell in 1982, Peter took his NROTC commission in the Navy and went to sea for a few years. He deployed to the Mediterranean, Caribbean and Atlantic operating areas, chasing (then) Soviet submarines. He later took an assignment ashore in Puerto Rico where he reports perfecting his tan and drink-mixing talents while still holding a steady job in the Navy. 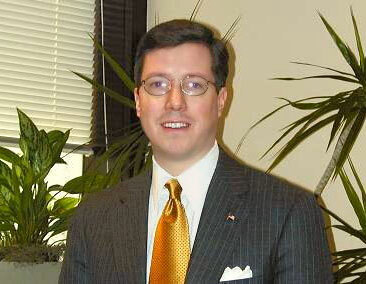 Following the Navy, he moved to Boston and worked in several large Banks before joining his current company, Welch and Forbes LLC (founded in 1838).His firm manages investments, mostly for the well-to-do and he has now been an investment portfolio manager for 12 years.He became a partner at the firm four years ago. "I am likely to remain until they cart me off," he reported. In addition to his investment responsibilities for more than $300 million in assets, he directs the firm's marketing literature production.Through that role he often works with graphic layouts and design. "When the opportunity arose to design a new logo for the foundation, I put that skill to work," he said. "The logo chosen was one of the first that came to mind, emphasizing the green and white of the fraternity's colors with a nod to Cornell's Big Red." In 1999, Peter met Lauren Smith and they married in 1994 in Newport, Rhode Island, with a handful of Alpha Delt brothers attending. They have twin boys, Alex and Teddy, now 8, who Peter hopes someday will follow his footsteps to Cornell and Alpha Delta Phi. "To all of my brothers cast far and wide, as well as to those that we have lost over the last 20 years, I say Xaipe and God bless," said Peter. He can be reached at pbrown@welchforbes.com. The foundation board expresses its gratitude to Peter and the other brothers who took time to design logos and images for the new foundation. These contributions of time, energy, and creativity are extremely valuable for uniting brothers behind the goals of the new foundation.